Wow, I'm fighting to stay awake this afternoon. Some sunshine at lunch seems to have sucked the life right out of me, and with no incentive to work on something useful, I thought I'd post about furniture. I always joke that my mom's favorite kind of chair is one that you're more comfortable looking at than sitting in. She is definitely one who would rather have no furniture than ugly but comfortable furniture. (Or even okay looking comfortable furniture). 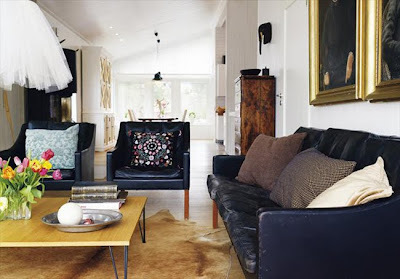 With that in mind, I'm always on the lookout for pieces of furniture that I feel might tempt her to buy, while sneaking some comfort in for those who come to visit her. 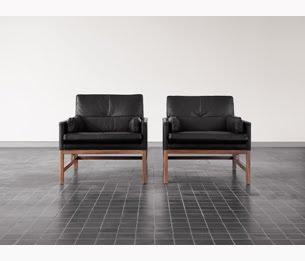 A couple of years ago I saw these chairs from the Conran Shop, and fell in love with them. They would be perfect for my mom, but honestly they'd do just fine at my house too. Unfortunately they were $6800 each. Um, yeah. 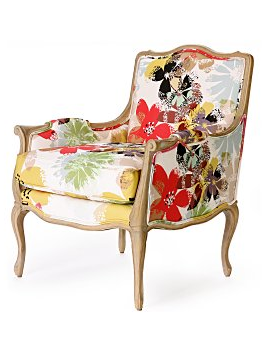 This morning, via Desire to Inspire, I saw similar chairs. They look even better with the worn in seat cushions. 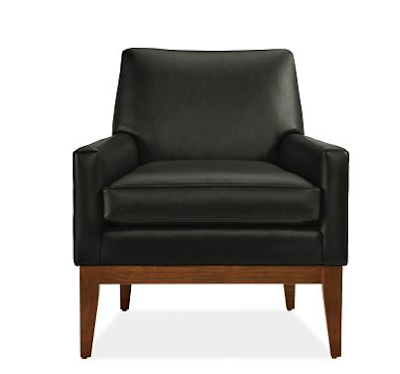 I've been eyeing this fairly close substitute, the Norton chair from Room & Board. I don't like the color of the brown legs, and wish that the crosspiece wasn't wood, but for a tenth of the original's price? I could compromise. Norton Chair, from Room & Board $799. Another inspirational chair for my mom's house is this chair that I saw while in San Francisco. It had a matching ottoman as well, but I couldn't find a picture. The chair alone rings in at $2025. It's beautiful, and comfortable in a non upholstered way, and being handmade with fine craftsmanship, totally worth a couple grand, I'm sure. However, way out of our price range. 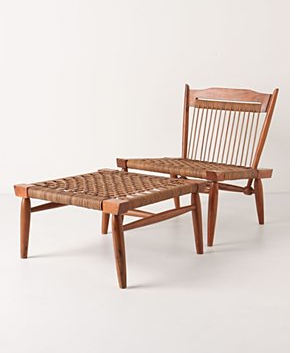 Lounge chair made by Richard Patterson, from Propeller in San Francisco, $2025. Sevilla chair and ottoman, $398 and $248, plus shipping. And so I suggest this substitute from Anthropologie. 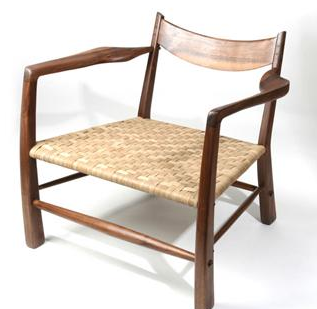 Minimalistic, with woven (leather) seat and a shaker like back, it's kind of reminiscent of classic Wegner chairs (even further out of my price range than the one above). I like it a lot, and its fairly affordable. Or at least comparatively affordable. Antwerp chair in Bloom, at Anthropologie. I saw this chair in the background of one of the Man Shops Globe episodes, I think the one about India? And although its completely of a different style than those above, I really like it. I've always classified my style as eclectic, and I'd say this proves it. Its on sale now, for $800. Love all of these! You know, a Room and Board is opening this spring in DC right down the street from me... And we have a guest room! JUST SAYING.